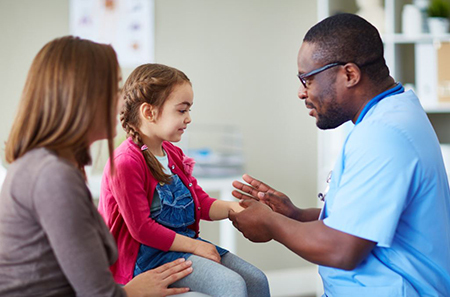 In a recent pediatric clinical trial supported by CRF Health, TrialMax® Touch devices were used to reduce the burden of data collection for caregivers of children with a rare disease. Children participating in the clinical trial were given an injection two times per week. With CRF Health’s solution, caregivers were able to easily record data about the children to allow the sponsors to measure the effectiveness and tolerability of the injection for this rare disease. CRF Health was awarded this trial for its experience with the patient population (young children) and for its thorough understanding of a day in the life of a caregiver. We were able to draw heavily upon our experience of working with this type of population. We know what this type of household is like – we know the challenges that young children with disabilities are going through, and what their parents and caregivers are going through daily. It was important that the caregivers and patients never feel overwhelmed by the trial. We made it our goal to reduce the burden on everyone as much as possible. The sponsor needed an expert on user experience, not only with using an eCOA system, but for understanding what life is like for families and children with rare diseases. CRF Health’s personal and professional experience with these users was a valuable asset to this trial and enabled its success. Let’s take a deeper dive into the challenges that this study needed to conquer. Due to the nature of studies involving young children, it can sometimes be diﬀicult to obtain the study information in a timely manner because caregivers are needed to report the data, and they have lots of priorities, including providing care for the child which can be a full-time responsibility. Additionally, to go to a doctor's appointment or site visit is sometimes very challenging if the child is not feeling well, experiencing symptoms that make sitting difficult, or requires additional medical equipment when out of the house. This puts extra pressure on the caregiver, who must take time oﬀ from work, pay for travel and meals on-the-go for themselves and their child, all of which adds up in terms of time, money, and stress. The use of the CRF Health’s eCOA solution allowed the sponsor to create a visit schedule which minimized subject visits to lesson this challenge. In any rare disease clinical trial, recruiting patients will be a challenge. It is diﬀicult to find subjects with the indication who also meet the inclusion criteria in a localized region because the disease is rare, therefore studies will need to widen their geographic scope to recruit enough subjects to power the trial appropriately to provide meaningful insights about the investigational compound. This was one reason the sponsor for this study decided to use eCOA. Without eCOA, more resources would have been necessary to accommodate this type of trial. Being able to track data and subjects in real-time is important on any clinical trial, but it is critical in rare disease studies. Rare disease studies have a small number of potential subjects, and recruitment is often diﬀicult. Tracking subjects to avoid study drop-out is key. Additionally, keeping track of the study data to ensure subjects and caregivers do not miss a dose is also very important to maintain accurate, high quality data with a smaller subject group. By having this type of data at-hand, sites can provide subjects and caregivers with positive feedback when data is submitted or check in with them if data is missing. The flexibility of TrialStudio® allowed the sponsor clinical team to design the questionnaire in a way that allowed them to come up with the best hybrid solution on the spot. Ultimately, CRF Health’s suite of solutions enabled several key benefits, which streamlined the trial so that the sponsor could focus on obtaining rich, clean, contemporaneous, and actionable data. CRF Health’s top priority was to reduce the burden on caregivers so that reporting the child’s study data was as simple as possible. To do this, CRF Health implemented TrialMax® Touch. TrialMax® Touch is a handheld device that contains the study questionnaire. The solution is portable, and fits into busy lifestyles which was very valuable for the caregivers. TrialMax Touch goes where the subject goes. If they needed to be outside of their home, or they were traveling, it didn’t matter because TrialMax® Touch enabled them to report the data from anywhere, at any time. Additionally, TrialMax® Touch allowed multiple caregivers, including parents, medical staﬀ, or other appropriate caregivers to enter the data, making it easy to report study information. CRF Health also implemented its TrialStudio® solution to ensure that the devices were designed to be user-friendly and intuitive. Caregivers could easily follow the prompts, which enabled them to provide accurate, clean data very simply. During preliminary meetings, it was easy for the sponsor to see the eCOA solution come to life because TrialStudio® enables easy design. This allowed CRF Health to maximize the user experience while satisfying the needs of the sponsor and the questionnaire. TrialManager® enabled the study team to monitor and manage eCOA data in real-time. This made it easy for the study team to instantly review data and act upon it as necessary. Positive feedback could be provided to encourage and reward caregivers for their submission. Similarly, study team members could reach out to check in on caregivers or subjects that have not submitted data, to make sure they are okay and compliant throughout the trial. As a result of the success on this study, the sponsor awarded CRF Health an additional trial studying another therapeutic area. Ultimately, CRF Health’s ability to understand the needs of the client and the needs of their subjects is the reason the sponsor chose CRF Health, and why they wanted to continue the relationship on future studies. CRF Health’s eSource solutions improve trial engagement by fitting into the lives of patients and seamlessly integrating into sites to maximize protocol compliance. The integrated TrialMax platform includes eCOA solutions for collecting PROs (Patient Reported Outcomes), ObsROs (Observer Reported Outcomes), ClinROs (Clinician or Rater Reported Outcomes), and PerfOs (Performance Outcomes), and features TrialConsent™, an electronic solution for collecting informed consent in clinical trials.